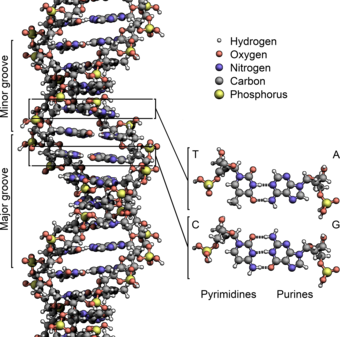 Deoxyribonucleic acid (DNA) is a molecule encoding the genetic instructions used in the development and functioning of all known living organisms and many viruses. Along with RNA and proteins, DNA is one of the three major macromolecules that are essential for all known forms of life. 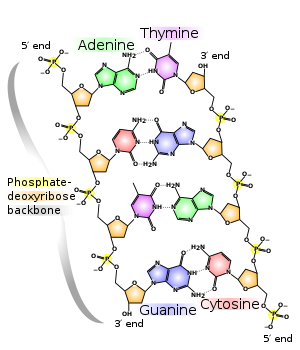 Genetic information is encoded as a sequence of nucleotides (guanine, adenine, thymine, and cytosine) recorded using the letters G, A, T, and C. Most DNA molecules are double-stranded helices, consisting of two long polymers of simple units called nucleotides, molecules with backbones made of alternating sugars (deoxyribose) and phosphate groups (related to phosphoric acid), with the nucleobases (G, A, T, C) attached to the sugars. DNA is well-suited for biological information storage, since the DNA backbone is resistant to cleavage and the double-stranded structure provides the molecule with a built-in duplicate of the encoded information. Uracil is not usually found in DNA, occurring only as a breakdown product of cytosine. However in a number of bacteriophages - Bacillus subtilis bacteriophages PBS1 and PBS2 and Yersinia bacteriophage piR1-37 - thymine has been replaced by uracil. A modified form (beta-d-glucopyranosyloxymethyluracil) is also found in a number of organisms: the flagellates Diplonema and Euglena, and all the kinetoplastid genera Biosynthesis of J occurs in two steps: in the first step a specific thymidine in DNA is converted into hydroxymethyldeoxyuridine; in the second HOMedU is glycosylated to form J. Proteins that bind specifically to this base have been identified. These proteins appear to be distant relatives of the Tet1 oncogene that is involved in the pathogenesis of acute myeloid leukemia. J appears to act as a termination signal for RNA polymerase II.